IPhone 6s has gone on sale this morning. Apple Stores opened at 8am BST for the occaision. If you havent already, don't forget to check our our iPhone 6s review and iPhone 6s Plus review. There hasn't been the same frenzy over the devices this time, probably because 's' models don't bring a different look to the iPhone and the iPhone 6 and iPhone 6 Plus were such a great handsets that the 6s doesn't offer the level of improvement needed for most of us to trade up. As usual, some started queueing for the handset over the last couple of days but queues this morning aren't reported to be massive with plenty of space left behind the railings at the Covent Garden Apple Store, for example. In a queue? 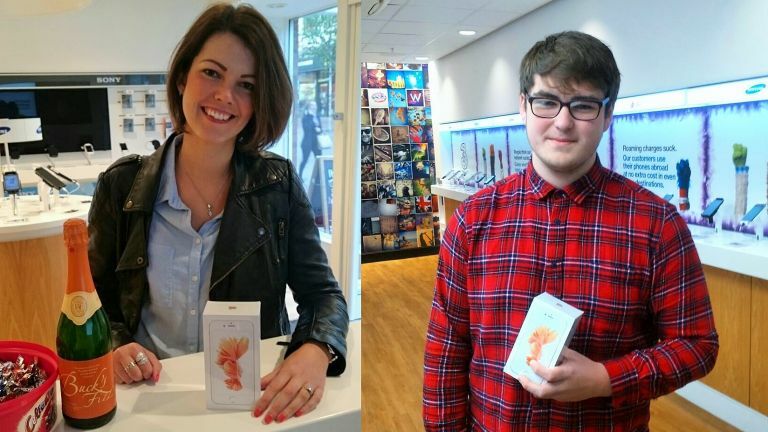 Tweet us your queue pics @t3dotcom or let us know how you're getting on buying your new phone in the comments below. iPhone 6s is available in the UK for £539 for the 16GB model, £619 for the 64GB model and £699 for 128GB. iPhone 6s Plus £619 for the 16GB model, £699 for the 64GB model and £789 for 128GB. Don't forget our thoughts on the 16GB model.